Tico: Only a little while the señora is teaching me, and already I hit everything. Angie: The trick is to get you to hit just one thing. When Gene Autry moved to Columbia Pictures, one of his goals was to at least periodically do his films in color. But that only happened for two feature films: The Strawberry Roan and this feature, one of the longest in the Autry canon. The titular Big Sombrero isn't a hat, but a ranch that takes Gene south of the border to try to help the downtrodden and foil the evil money men. Gene is on the road after the show he was with closed down, when he runs into Angie Burke (Vera Marshe), a former trick shooter turned duenna for se�orita Estellita Estrada (Elena Verdugo). Estellita is owner of a Mexican ranch, El Sombrero Grande, though she has little interest in its operations. She leaves that to boyfriend Jimmy Garland (Stephen Dunne), who is secretly in cahoots with wealthy Ben McBride (Gene Stutenroth) to get control of the ranch by marrying Estellita and then sell out to McBride. Jimmy hires Gene on as foreman with orders to throw all the Mexican squatters off the lands before they can get their cattle to market. Gene accepts, but conspires with the Mexicans to move their cattle off the ranch. McBride doesn't take no for an answer, though, and things turn deadly before long. The picture opens with quite a shocker: Gene pawns his guitar! That doesn't stop him from being musical, though, and the movie features seven songs (though none of them are particularly memorable). Nevertheless, they're well staged and there's a fair amount of colorful Mexican costuming, taking advantage of the Cinecolor presentation. It's also a bit more violent than the typical Autry feature, with a gun battle resuting not only in the death of a sympathetic character, but blood as well. Verdugo makes for an appealing leading lady, with plenty of spitfire in the character. The main shortcoming is that her accent comes and goes with alarming regularity. Dunne is so sleazy and villainous that it's hard to see what Estrellita sees him. Without the usual Autry sidekick in tow, the comedy relief is handled by Marshe, who is frequently hilarious in her sauciness. There are also some good bits with William Edmunds as the elderly padrino, Don Luis, who is horrified by the skimpy bathing suits of Estellita and Angie. Which, come to think of it, is as good an excuse for color as any. While it sticks close to the Autry formula, the added running time allows for more fleshing out of the characters, to their benefit, and the sympathetic look at the poor Mexican squatters may come across as shocking to some today. Image Transfer Review: While the Cinecolor on The Strawberry Roan had some issues, that on this disc looks marvelous, without any fringing, and nice strong blue levels. There are no issues beyond the occasional speckle. Detail is nice and crisp for the most part and the colors seem natural if a shade subdued. The scenery looks first rate. The use of a dual layer disc permits a nice high bitrate that avoids any compression issues, which have occasionally been a problem on a few past volumes. Audio Transfer Review: As is the case with the video, the audio in its 2.0 mono format is quite clean as well. The range is limited as one would expect for 1940s mono, but the songs sound good and the dialogue is clear. Hiss and noise are quite subdued and almost never noticeable. Extras Review: Gene and Pat Buttram reminisce again in the Melody Ranch Theatre segments devoted to this feature, and Gene also talks a bit about his various guitars and their history. The Melody Ranch radio show from April 30, 1949, when The Big Sombrero was in release, features Pat and his talking duck, a mail order Mexican girl, and Gene's rendition of Ghost Riders in the Sky, which is all I need to recommend this disc by itself. But there are over 75 stills and more than 25 lobby cards and posters in several galleries, and a brief set of production notes. The eighth episode of The Phantom Empire "Jaws of Jeopardy" is included as the Gene Autry Foundation continues to celebrate his centennial. 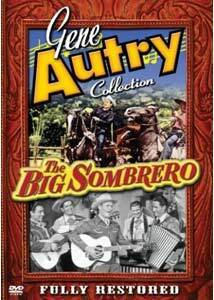 Fans of movie trailers have hit the jackpot here, with an amazing array of 23 Autry trailers included (but oddly, none for The Big Sombrero). They're mostly from his Columbia years, and some are reissue trailers, but they're in reasonable condition and a lot of fun to boot, with about a quarter of Autry's entire output represented here. Another fun and colorful Autry film that makes good use of a longer running time. It looks and sounds terrific, and trailer fans will be overjoyed by the collection included on this DVD.